Register today for an online painting class with Art by Megan! Click here to snag your spot in the class! It’s time for a paint and wine night from the comfort of your home! Just grab your laptop, some painting supplies, and follow along as you get all the in-person workshop feels you were looking for. But how, you ask? 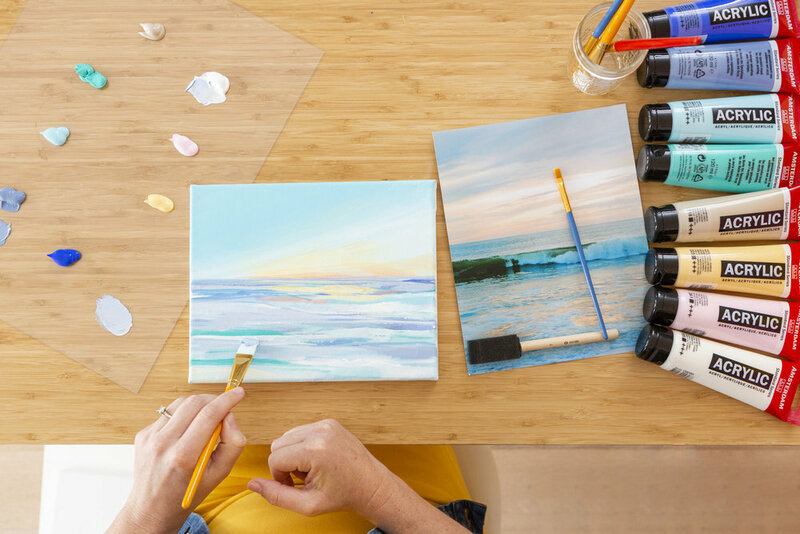 Well, not only will your instructor share all of her pro tips and techniques on how to paint a beautiful ocean landscape, but the class will have you learning along with four other beginner painters, too! Throughout the course, Megan will be helping the students with various painting techniques so that you can all come away with paintings you're proud of. Mix pastel colors to create your abstract ocean along with pretty wave effects. Use various brush techniques to create details and textures to your ocean landscape. STUDENT PERK: As an extra bonus, a student who enrolls in the class will get an exclusive course workbook that Megan helped create AND a bonus inspiration photo to use for practice! Ready to up your painting skills? Enroll in our Acrylic Painting: Abstract Landscapes Workshop today!